Truffles are among the many foods infused with THC – the chemical in marijuana that gives you a high — already for sale in Colorado. Where there's pot, there's pot brownies. But how do you make sure those high-inducing sweets are safe to eat? Colorado regulators are wrestling with that question now that the state has legalized recreational marijuana. From sodas and truffles to granola bars and butter, food products infused with THC – the chemical in marijuana that gives you a high — are already for sale. The problem? Marijuana is still illegal under federal law. And that means the existing food safety system, which relies heavily on support from federal agencies, can't ensure that marijuana-infused foods are safe. Purveyors of pot-laced foods say they want the regulation. "We are under a microscope," says Christie Lunsford, marketing and education director for Dixie Elixirs, a manufacturer of foods infused with THC. "Even my competitors, who are food novices, they really care about providing for the consumer and making sure they're safe." That's created new demand for businesses like CannLabs, a facility where chemists pick apart marijuana products to find out if they're safe to smoke or eat. Owner Genifer Murray is preparing for a boom in business. "CannLabs started in a space of about 150 square feet," she notes during a tour of the company's offices. "This is about 500 and we're moving to 2,000." New state rules go into effect this year that require businesses to test their marijuana products in labs like Murray's. Until this point, tests for mold, foodborne pathogens and potency were voluntary, meaning few companies actually did them. Murray says new potency standards could help prevent marijuana novices from, say, eating too many prepackaged special brownies in one sitting. "You can feel like you're dying," she says, describing what it feels like when you take in too much THC. "Your heart rate speeds up, you sweat, you can throw up. I mean, it's awful. 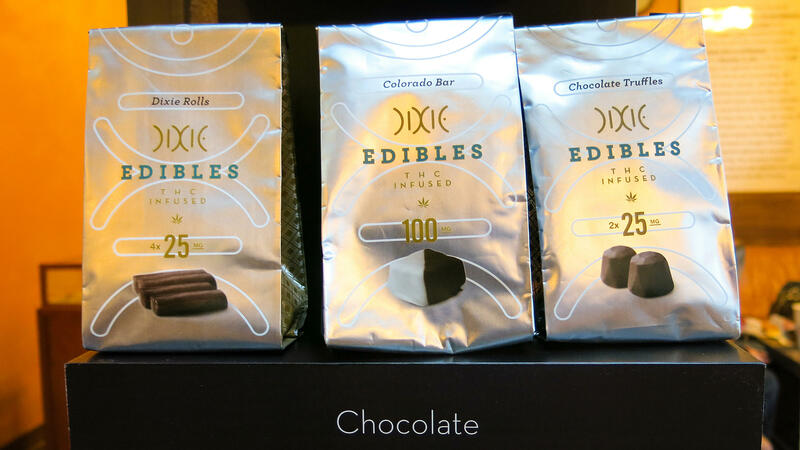 So with edibles, it is very important that they get tested and that you know your dose." The enforcement and creation of the industry's rules is the responsibility of the small Marijuana Enforcement Division. It was created to watch over the medical marijuana industry, but Colorado's experiment in recreational use has expanded the division into areas it never would have been before, like food safety and lab certification. "To a large extent, we're learning a lot as we go along," says Lewis Koski, the division's chief. "The right thing to do, from a regulatory standpoint, is to make sure we can comprehensively regulate all these businesses and ensure the health and welfare of the citizens of Colorado." Because Colorado is one of the first states to draft rules for recreational marijuana, all eyes are on Koski. "It's a new agency. If you're just going to start up a new agency – [even] in a public policy arena that wasn't this divisive — it'd be pretty challenging," he says. Colorado has already taken some innovative steps in ensuring public safety. For example, state regulators have rolled out a system that tracks all marijuana plants from seed to sale, meaning if a pot cookie caused a salmonella outbreak, you could track it all the way back to the source. That tracking system is just one piece of a much larger set of rules used to keep the recreational marijuana industry in check. And with more states legalizing marijuana, both recreational and medicinal, you can guarantee they'll be watching to see if this regulatory scheme built from scratch actually works. This story comes to us via Harvest Public Media, a public radio reporting collaboration that focuses on agriculture and food production. Meanwhile, Colorado is dealing with a different kind of drug problem. You'll remember that state made history this year by opening licensed marijuana retail shops. Well, pot is already a big business in the state, and they're not just selling bags of weed. Edibles are a big part of the business. That's food, brownies, of course, but really any kind of food you can imagine laced with marijuana. Of course, the federal government still considers pot illegal. So the existing food safety system, which relies heavily on federal agencies, can ensure pot-infused food is safe. From member station KUNC, Luke Runyon reports. LUKE RUNYON, BYLINE: Christie Lunsford sneaks past a roped-off line of about 25 people at the 3D Cannabis Center in Denver. Lunsford is the marketing director for Dixie Elixirs, a manufacturer of foods infused with THC, the chemical in marijuana that gives you a high. LUNSFORD: So our edible line has things like handmade, hand-dipped truffles. RUNYON: And sodas, fudge and mints. Other companies churn out baked goods, granola bars and butter. As the market expands for THC-infused foods, new concerns about quality are popping up. It's not just medicinal anymore. Sales are open to the general public. That means the labels of consume at your own risk and buyer beware don't quite cut it anymore. LUNSFORD: We are under a microscope. And even my competitors who are food novices, they really care about providing for the consumer and making sure they're safe. RUNYON: So who's responsible for food safety? Right now it's the state because marijuana use is still considered illegal by the federal government. GENIFER MURRAY: Yeah, so this is our lab. RUNYON: In a corporate park on the other side of the city is CannLabs, a facility where chemists pick apart marijuana products to find out if they're safe to smoke or eat. Owner Genifer Murray is preparing for a boom in business. MURRAY: Actually, CannLabs started in a space of about 150 square feet. This is about 500, and we're moving to 2,000. RUNYON: New state rules go into effect this year that require businesses to test their marijuana products in labs like Murray's. Until this point, tests for mold, food-borne pathogens and potency were voluntary, meaning few companies actually did them. Murray says new potency standards could prevent marijuana novices from, say, eating too many prepackaged special brownies in one sitting. MURRAY: You can feel like you're dying. Your heart rate speeds up, you know, you sweat, you can throw up. I mean, it's awful. So with edibles, it is very important that they get tested and that you know your dose. RUNYON: The enforcement and creation of the industry's rules is the responsibility of the small Marijuana Enforcement Division. It was created to watch over the medical marijuana industry, but Colorado's experiment in recreational use has expanded the division into areas it never would have been before, like food safety and lab certification. Lewis Koski is the division's chief. LEWIS KOSKI: To a large extent, we're learning a lot as we go along. And, you know, the right thing to do, you know, from a regulatory standpoint, is to make sure we can comprehensively regulate all these businesses and ensure the health and welfare of the citizens of Colorado. RUNYON: Because Colorado is one of the first states to draft rules for recreational marijuana, all eyes are on Koski. KOSKI: It's a new agency. If you were just going to start up a new agency in a public policy arena that wasn't this divisive, it'd be pretty challenging. RUNYON: Colorado has taken some innovative steps in ensuring public safety. They've rolled out a system that tracks all marijuana plants from seed to sale, meaning if a pot cookie caused a salmonella outbreak, you could track it all the way back to the source. That tracking system is just one piece of a much larger set of rules used to keep the recreational marijuana industry in check. And with more states legalizing marijuana, both recreational and medicinal, you can guarantee they'll be watching to see if this regulatory scheme built from scratch actually works. For NPR News, I'm Luke Runyon in Denver. RATH: That story came to us from Harvest Public Media, a public radio reporting collaboration that focuses on food production issues.